Almond is actually not a nut but is more like peaches. They have a good flavor and are consumed as they are, salted or added to various dishes. The sweet almond oil extracted from almond is used for cooking and also externally applied for healthy skin and hair. Sweet almond oil has great moisturizing properties and is excellent for dry skin. It is a rich source of Vitamin E, B1, B2, A, B6 and keep the skin well hydrated. It is ideal for irritated and dry skin. Moreover, sweet almond oil is easily absorbed by the skin and therefore does not make your skin oily or greasy, nor does it block the pores of your skin. It leaves a sweet fragrance on the skin after application. Applying sweet almond oil under your eyes is a natural way to get rid of any dark circles that might have formed on your face. Apply this regularly before you go to sleep at night. After a couple of weeks you will start getting positive results. Almond oil is good for crow’s feet as well. Applying this on the skin is very effective for getting rid of wrinkles, blemishes and fine lines on the skin. Vitamin E present in this oil makes your skin firmer and thus helps you fight against signs of ageing like wrinkles, fine lines, pigmentations and so on. Sweet almond oil is used widely in spas and salons and is excellent for skin treatments and massage therapy in the spa. It is very effective and makes your skin healthy and glowing. 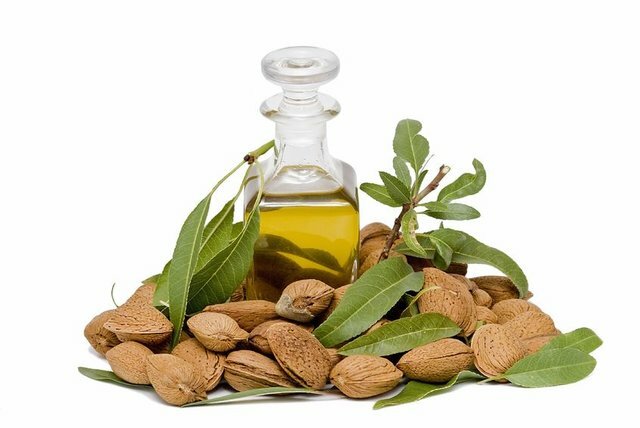 Sweet almond oil is added with other essential oils and is used in many of the skin care products like face packs, soaps, body and face washes and massage oils. This oil makes an excellent substitute for hand and foot cream. Being light and non-greasy, it is immediately absorbed by the skin and makes your skin look fresh and smooth. The zinc present in sweet almond oil is effective for healing the skin and preventing dryness of the skin. You can easily remove the cracks that appear on your foot by applying almond oil. Sweet almond oil is perfect for removing makeup as it is light and non-sticky. It removes all traces of makeup from your face by opening the pores and also prevents the appearance of pimple and acnes. It is good for all types of skin. Exposure to sun often causes your skin to get tanned. Sweet almond oil is very beneficial for removing tan. Mix sweet almond oil, lime juice, honey and milk powder and make a paste. Apply this on your skin and leave for about 20 to 25 minutes. Wash off with clean water. This helps in removing tan. It also gets you back the moisture that you have lost, thus keeping the skin well hydrated and supple. The emollient qualities of sweet almond oil makes it very effective for nourishing the skin as well as making it stronger. If you massage your body with almond oil, the blood circulation is increased and this helps in preventing stretch marks. So, pregnant women are advised to apply almond oil on their body as they are very susceptible to stretch marks during the period of their pregnancy. Almond oil acts as a hair serum and keeps your hair healthy and strong. The vitamins present in almond oil help in treating various hair problems like hair loss, frizzy hair, split ends as well as dull hair. This oil is also good for treating the wear and tear cause to your hair as a result of pollution or excessive use of styling products. So massage your hair and scalp regularly with almond oil and keep your hair healthy and glowing. Almond oil has the ability relive muscle pain and stress. So it is used widely as a painkiller. If you have any pain in the joints, heat this oil and apply it on the affected area. You will get relief soon. So use this oil to massage your body regularly and you can keep muscular pains at bay. Consuming sweet almond oil regularly helps in making your immune system strong, so that you can fight infections and other diseases. It also has laxative properties, which makes it perfect for digestion. If you are suffering from constipation, have almond oil and you will get relief. Sweet almond oil is high in potassium content but low in sodium. So it is good for controlling the cholesterol level in the body and also to maintain the normal level of blood pressure. Sweet almond oil is a rich source of mono saturated fats, folic acids, protein and potassium, and therefore excellent for the health of the heart. So, include almond oil in your daily diet and this way you can keep your heart healthy and strong. Just one teaspoon of this oil added to your cooking is enough to make your heart stay healthy. Almond oil is pale yellow in color and has a high flavor. Vitamins and minerals like calcium, magnesium, potassium, Vitamins E and D etc are found in high quantities in this oil. So you can say that it contains essential nutrients that are important to keep your body healthy.